352 Global Earthquakes, >= 7.0 Magnitude by Country. | Chaos Sweeps Away the World We Know! The Disaster, current events & Catastrophe Blog. Forecasts for 2014 to 2022. Read tomorrows news today! Plus current economic, commodities, stock indices and financial news. ← Four Earthquakes in Three Days is only the Beginning of the End. June 18, 2013 – Significant Global Earthquakes by Country: I downloaded 352 global earthquakes from 1973 to 2012, greater than or equal to (>=) 7.0 magnitude. I sorted the quantity by country from highest to lowest and graphed the results you see above. Clearly, Indonesia had significantly more quakes (45) than second place Japan (27). It is interesting to note that the 290 tremors graphed above, represents 82.4% of the total 352 quakes (>= 7.0 Mag.). Additionally, the top two countries, in terms of quantity of quakes, also saw the two most recent mega-quakes and tsunamis. Japan on March 11, 2011 and Northern Sumatra, Indonesia; on December 26, 2004. Further, notice that the United States placed fourth with 21; composed of 12 for Alaska, 9 for California, and 1 each for Idaho and Hawaii = 21. If you add the four for Guam (a U.S. Protector it) that brings the total to 25, which is tied with Russia. Speaking off Russia, most of those 25 quakes occurred in the far east along the Kuril Island Chain. Similarly, most of the 12 Alaska quakes occurred along the Aleutian Island Chain. Lastly, based strictly on history and probabilities, the next big meg-quake will probably occur among the top ten countries, which accounted for 214 out of the 352 major quakes (61.1%). This entry was posted in Aleutian Islands Earthquakes, Australia, California, Chile, Chile-Bolvia, China, Death, Disasters, Earthquake, Events, Fiji, Indonesia, Japan, Mexico, Misc, Miscellaneous, Nature, New Caledonia, New Zealand, News, Pacific Ocean, Papua New Guinea, Papua New Guinea, Peru, Peru-Bolvia, Philippines, Philippines, Ring of Fire, Russia, Samoa, The Kingdom of Tonga, The Ring of Fire, The Sandwich Islands, The Solomom Islands, United States, Vanuatu and tagged 352 global earthquakes from 1973 to 2012 greater than or equal to 7.0 magnitude graphed by the top 20 by country - Indonesia 1st, alaska, Aleutian Island, Earthquake, guam, indonesia, Japan, Japan 2nd, russia, Russia third, the master fo disaster, U.S. 4th, United States. Bookmark the permalink. 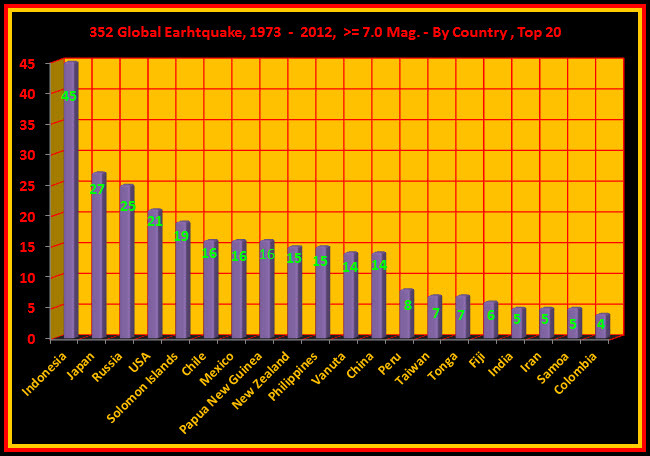 1 Response to 352 Global Earthquakes, >= 7.0 Magnitude by Country. My guess for the next large mega-thrust quake is for New Zealand/Tonga/Fiji margin.